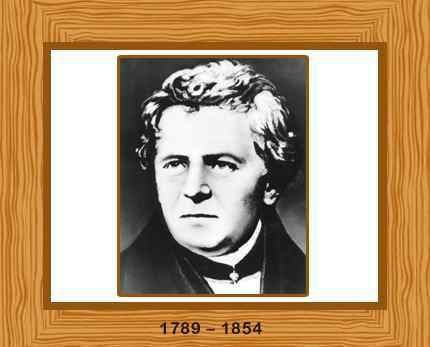 Georg Simon Ohm was a German physicist, best known for his “Ohm’s Law”, which states that the current flow through a conductor is directly proportional to the potential difference (voltage) and inversely proportional to the resistance. The physical unit of electrical resistance, the Ohm (symbol: Ω), was named after him. Born on March 16 in 1789 in the university town of Erlangen, Bavaria, his younger brother Martin Ohm also became a famous mathematician. His father, Johann Wolfgang Ohm, was a locksmith and his mother Maria Elizabeth Beck, who died when Georg was ten years old, was the daughter of a tailor. Johann Ohm taught his children science and mathematics at home and Georg also attended Erlangen Gymnasium for four years. In 1805, at the age of fifteen Georg Ohm began studying at Erlangen University but he left after three semesters having spent much of his time enjoying himself dancing, ice skating and playing billiards and too little time on his studies. Ohm was then sent to Switzerland in 1806, accepting a position as a mathematics teacher in a school in Gottstadt. In 1809, Ohm became a private tutor in Neuchâtel, Switzerland. As well as his teaching obligations, Ohm found time to continue his private study of mathematics. In 1811, Ohm returned to Erlangen University earning a doctorate that same year, and then becoming a Privatdocent (an unsalaried teacher). Ohm returned to school teaching in 1813, teaching mathematics and physics and writing a geometry textbook at a poor quality school in Bamberg for three years. In 1817 he accepted a position at a Jesuit gymnasium in Cologne in 1817 and here he spent time carrying out physics experiments in the well-equipped laboratory. While here, he developed his important theory between the relationship of resistance, electric current and voltage. In 1825, Ohm published his first paper which examined the decrease in the electromagnetic force produced by a wire as the length of the wire increased. It was not well received. Ohm published two more papers in 1826, and his famous book containing Ohm’s law, in 1827 in which he detailed his complete theory of electricity. Resigning his teaching position in 1828, Ohm was without permanent employment until 1833 when he accepted a professorship at the Polytechnic School of Nuremberg, remaining there for sixteen years. In 1849 he became curator of the Bavarian Academy’s physics cabinet at Munich, and in 1852 was appointed to the chair of physics at the University of Munich, a position he held until his death. While teaching in Cologne, Ohm started passionately working on the conductivity of metals and the behavior of electrical circuits. The unit of current is the ampere (I); that of potential difference is the volt (V); and that of resistance is the ohm (Ω). This equation, as defined using the unit of resistance above, was not formalized until the 1860’s. Ohms Law states that the current flow through a conductor is directly proportional to the potential difference (voltage) and inversely proportional to the resistance. After initial criticism, most particularly by Georg Hegel, the noted creator of German Idealism, who rejected the authenticity of the experimental approach of Ohm, the “glory” finally came in 1841 when the Royal Society of London honored him with the Copley Medal for his extraordinary efforts. Several German scholars, including an adviser to the State on the development of telegraph, also recognized Ohm’s work a few months later. The pertinence of Ohm’s Law was eventually recognized. The law still remains the most widely used and appreciated of all the rules relating to the behavior of electrical circuits. He received the Royal Society Copley medal in 1841. Georg Ohm was made a foreign member of the Royal Society in 1842, and became a full member of the Bavarian Academy of Sciences and Humanities in 1845. Ohm died on July 6, 1854. He was 65 years old. The physical unit of electrical resistance, the Ohm (symbol: Ω), was named in his honor.